Kicking off its 75th anniversary, Hawaii Community Federal Credit Union hosted the annual Market Day at all five branch locations during International Credit Union Week. 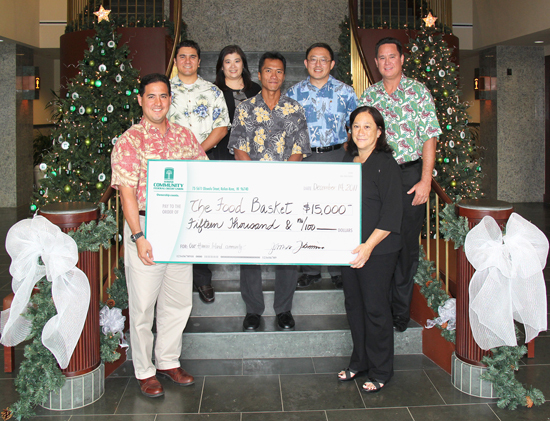 The event raised $15,000 for The Food Basket, Hawaii Island’s clearinghouse for food and non-perishable items. The annual Market Day effort and its results exemplified this year’s International Credit Union Week theme of “Credit Unions Build a Better World.” Market Day featured fresh produce, baked goods, rummage sale items and crafts. The Food Basket supports more than 100 non-profit agencies to help alleviate hunger in Hawaii Island communities. Hawaii Community Federal Credit Union is a not-for-profit credit union, wholly owned by its more than 38,000 member/owners. The financial institution has branches in Honokaa, Kailua-Kona, Kaloko, Kealakekua and Kohala. In addition to complete checking and savings services, the credit union offers credit cards, auto, mortgage, construction, small business, educational and personal loans; investment services; money-saving programs and more. It sponsors Student Credit Unions at Kealakehe, Kohala and Konawaena high schools, Children’s Savings Projects at elementary schools from Paauilo to Hookena and supports numerous Island of Hawaii programs and events. Membership in Hawaii Community Federal Credit Union is open to all island residents.